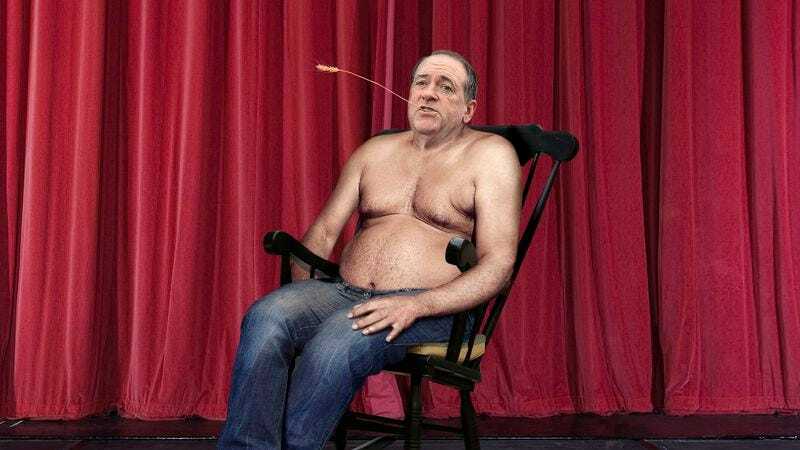 SIMI VALLEY, CA—Reckoning it was dern near hotter on the stage than a $2 pistol, a shirtless Mike Huckabee reportedly spent the entire Republican primary debate Wednesday seated in a rickety rocking chair. “This economy’s been done ruined on account of President Obama getting too big for his britches and making a whole mess of new laws that feared away all them small business owners,” said Huckabee, pausing to take a drink from a ladle in a rusty copper bucket while wiping sweat from his brow with a rag pulled from the back pocket of his filthy blue jeans. “This country’s gone all out of kilter and I’m nearbout more ornery than a possum that got stuck in a barrel and rolled down a hill. Hear tell, a whole heap of y’all out there are a-fussin’ and frettin’ about what kind of future we’re fixin’ to leave to our young’uns.” At press time, sources confirmed Huckabee was picking at a splinter on the blackened underside of his foot.